The Transportation Security Administration (TSA) has been reporting on an annual basis the number of firearms found concealed in carry-on bags across the United States. Last week, TSA reported for 2018 a record-setting 4,239 total firearms seized, averaging 81.6 firearms per week. It is amazing that with all of the marketing that TSA and others have been doing that this number of concealed firearms is still being found. It is also remarkable that for the same year, 3,656 were loaded and 1,432 had a round chambered. The following table shows these statistics for 2015-2018. The data illustrates that the number of firearms being seized has been increasing over the past four years and that the rate of seizure per 1,000,000 passengers has also been increasing. The increasing rate of seizure should be considered a TSA success story. 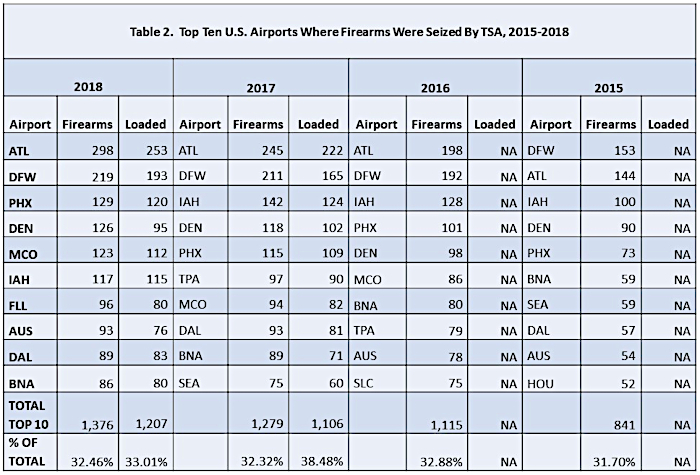 The following table identifies the top 10 U.S. airports by number of firearms seized by year, 2015 through 2018. Hartsfield-Jackson Atlanta International Airport (ATL) has consistently ranked number one or number two in terms of firearms seized since 2015, followed by Dallas/Fort Worth International Airport (DFW). For 2018, Phoenix Sky Harbor International (PHX) was ranked third. The data do not tell the reader how effective TSA is at seizing weapons, and that requires looking at another dataset which is not publically available. These effectiveness data are gathered by Red Team inspectors who conduct thousands of tests at airport checkpoints, access control systems, checked baggage screening, cargo screening, and other sites to repeatedly expose shortcomings of the security system. The data are used as part of a quality assurance program to identify lapses in the system so security personnel and management can learn from the mistakes. While most firearms (by airport) are seized in Atlanta, the data presented above do not identify how many are missed or where TSA can improve. Not providing the TSA data to the public has advantages and disadvantages. For someone like myself, with an economics and policy background, it would be extremely useful to know how resources are being provided and where the resources would be needed most. For a bad actor, however, that same data could allow them to target their limited resources at TSA’s most vulnerable locations (i.e., airports where the likelihood of passing a weapon into the sterile area is easiest). Ultimately, while we do not know how many concealed weapons TSA is missing, the data on weapons seized show that when it comes to firearms and airport security, TSA’s mission is as important as it has ever been.